Taqueria Tepatitlan is located in the heart of the art community on the historic west side of Ventura. From the freshest ingredients, to the careful preparation, to the courteous service, the experience is authentically Mexican. Bold, unique, flavorful dishes complemented by an atmosphere warmed by family and friends. 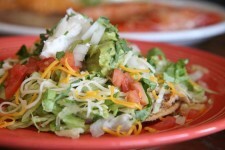 Come enjoy the best Mexican food in town!